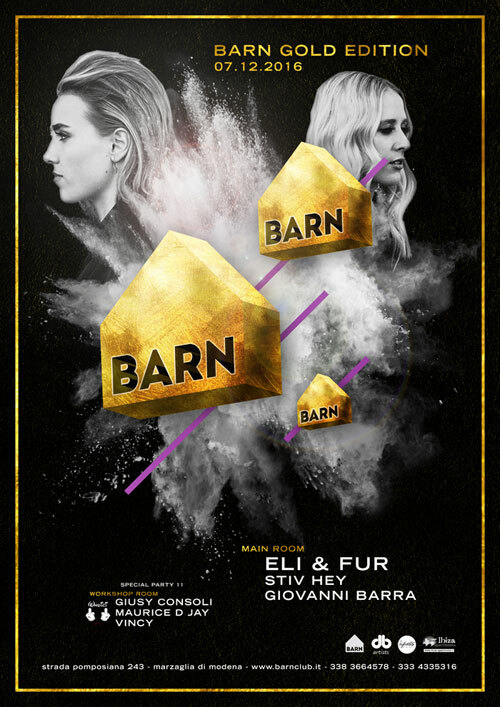 Since breaking onto the scene in 2013, Eli & Fur have been perfecting a sound built around infectious melodies and seductive vocal lines which have mesmerized dance floors & radio waves from London to Los Angeles. Their captivating sets have seen the duo play alongside the likes of Maceo Plex, Hot Since 82, Kölsch and Seth Troxler. Appearing on line ups from Ants, Vagabundos, Bugged Out and Digital with their Festival highlights including Creamfields, Leeds Festival, Bestival and the ultimate of all festivals, Glastonbury. The duo’s debut track, ‘You’re So High’ reached the top 3 on Hype Machine and has since picked up over 3 million plays. ‘Seeing is Believing’ saw the girls collaborate with Shadow Child and release on Defected, ‘Feel The Fire’ came on Anjunadeep and ‘Your Eyes’ saw the girls self-release on NYX Muisc and team up with Beatport in the first ever Artist Partnership on Beatport’s newly launched streaming platform. More recently Eli & Fur released the incredibly received ‘California Love’ EP which propelled them in the US and helped them gain their first ever performance on Coachella 2016. 2015 saw the rise and rise of Eli & Fur. Tipped by Beatport as 2015 Artists to Watch, they’e since been nominated for ‘Best Newcomer’ in The DJ Awards, ‘Best Producer’ in the Bass Music Awards, ‘Best Breakthrough DJ’ at DJ Magazine’s ‘Best of British’ and more recently ‘Best Breakthrough Artist’ in the 2016 IDMA Awards. Their productions have been heavily supported by the champion of dance music, Pete Tong, and the girls are set to unleash their next wave of releases and a series of collaborations which have seen them pair up with Dantiez Saunderson, Tâches, Erick Morillo, Santé and more. Eli & Fur rolled out 2015 with a Thelma & Louise inspired tour through North America. Documenting every step of their 13 city tour on Go-Pro, taking planes, train, automobiles and boats, dropping into radio stations, studio sessions, TV networks and clubs. It was an unusual way to approach the US market but a life time dream inspired by quite possibly the two coolest chics ever to grace the big screen. The end result is the self-made video for California Love. So with an impressive 2015 in the bag it looks like 2016 will be a year of continued success. Few DJ’s can own more than one genre, but this is one skill that sets Nathan Barato apart from many artists. Nathan’s versatility allows him to break boundaries and win over fans of many different sounds. For the past 15 years, Nathan has been a favourite in the Toronto scene, and began his career rolling with legends like Peter and Tyrone. In the early years, Nathan’s innate ability to win the crowd over with his groove scored him gigs at legendary Toronto nightclubs such as Industry, Mad Bar and System Soundbar. His talent and dedication eventually progressed him into residencies at The Guvernment and Footwork, as well as his own night, “Weird Science” at the long-standing and legendary Comfort Zone. Throughout his career, Nathan has played in cities throughout North America and Europe, but considers Toronto his home base. Nathan has been working hard in the studio and has completed many recent productions as well as upcoming releases on labels such as Rekids, Defected, Culprit, D-Floor, Blackflag, MOOD, King Street, Bitten and his own Roots And Wings Music. Musically, Nathan’s range dabbles in many genres within the 4/4 spectrum going back to his influences of 90’s garage, and ranging to many spans of current club music. Radio Slave’s widely respected Rekids imprint signed “Back Up Queen” which received huge support from the likes of Danny Tenaglia, Satoshi Tomeii, Ryan Crosson, Droog, Matt Tolfrey, Tensnake, Nicolas Matar, Guti, Kerri Chandler, Leon, D’Julz, Solomun and many other. The track also made the top 20 in Beatport and held strong for nearly 7 weeks. Defected Records picked up Nathan’s big room dance hall influenced, ‘Hard Werq’ which went on to also crack the top 20 in Beatport and is still holding chart to this day. “Hard Werq” has also been slotted as 20th on the most charted in Resident Advisor for October 2012. Nathan has recently released a new EP on 2000 And One’s, Bangbang! Records which has received promo support from the likes of Stacey Pullen, Nicole Moudaber, Loco Dice, Russ Yallop, Carlo Lio, Leon, Nice 7, D’Julz, Chus & Ceballos and others. Up next, Nathan has EP’s coming out in the next few months on many labels including Stacey Pullen’s Blackflag Recordings, Nicole Moudaber’s MOOD Recordings, L.A. based Culprit imprint owned and run by Droog, and D-Floor, a new label owned by Leon, Pirupa & Nice 7. His upcoming singles will include a second release on Rekids, as well as one for the legendary NYC based King Street Sounds. Remixes in the coming months will include Nice 7’s popular “Bassline Soldiers” on Defected Records. With a heart for the music and a mind for business, Nathan has been able to successfully launch and operate two labels. In 2004 Nathan founded RAWthentic Music with his brother Jason. He managed and operated the label for three years before selling it to close friend and music partner Carlo Lio. In 2009 Nathan launched Roots and Wings Music which features awesome, reputable and upcoming artists such as Bubba, The Junkies, Philip Arruda, Huxley, Leon, Matt Tolfrey & Inxec, Matt Star, Hector, James Teej, Tausend and Nathan himself.